It’s not like we’re oblivious to this. We’re not just TechCrunch writers and editors, we’re also, first and foremost, TechCrunch readers. It’s a pain point for us that our current site has the distinct honor of being among the slowest at AOL. AOL is, well, pretty slow. We took the scads of this type of anecdotal, and later much more formal, feedback into account when prioritizing our latest design, aiming for simplicity and optimal page load first and foremost. While there is definitely room for creativity and pizzazz! when presenting the news, if a news site isn’t immediately conveying needed information to you as fast as possible, it has failed. See: Techmeme for a great example of this. Our new website is speedy, clocking in at an initial five seconds of desktop page load time versus 15 seconds, with each subsequent load taking about three seconds in user tests. Our mobile site is now a first-class citizen, displaying features just as robust as our desktop, including all 20 home page headlines, our CrunchBase islands and event calendar. Its site-load time is around 10 seconds but will continue to improve after launch, as we continue to optimize for speed. The new site is clean and fast, and now our logo is free of clutter, too, with the gaudy pixelation being removed entirely. We’ve decided to keep the outline of the new logo, however, because as our first project manager Dave Feldman explained during our last redesign in 2011, “It’s the first and only design Heather, Mike and I looked at and said yeah, that’s it. It screams TechCrunch.” None of the logo changes we looked at “screamed” anything, so we’re going to go with what Arrington liked. In addition, font snobs among you may have noticed that we’ve changed the font for headlines and body text to Alright Sans and Open Sans, respectively. Nothing, not even 24/7 Helvetica, will appease you guys. Though it’s not exactly haute couture, we’ve revamped our feature article template to improve article layout, with larger images and video playback. 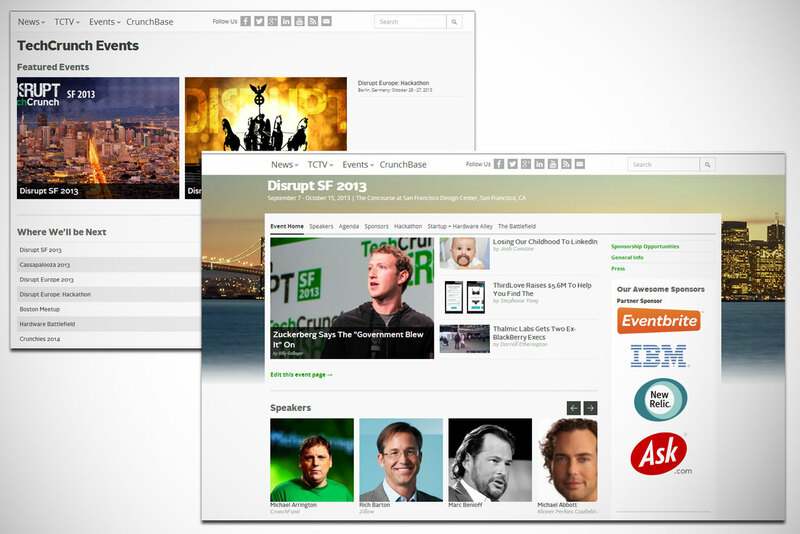 Overall TechCrunch.com is now cleaner, more readable, and less cluttered, without sacrificing our competitive advantage: scrappiness. We have also made it easier to stalk follow and connect with our individual star writers. From a 27-inch monitor to an iPhone screen, the new site adjusts to all screen sizes due to a single codebase for web and mobile. Users of extra-large screens will notice extra features on the sides while some of these bonuses are stripped away on smaller screens. Within individual posts, there is strong focus on recirculation, because we want users to easily find our invaluable, evergreen content on TC. Like this Twitter launch post from 2006. Speaking of invaluable, our massive startup database, which we’ve managed to keep in the family, is now much more prominently featured. From article pages to the front page, CrunchBase is now deeply integrated into TechCrunch — as it should be. You’ll now occasionally be seeing the CrunchBase island in the main article river, in addition to stacked CB cards in article templates. In order to improve navigation and the logical organization of our site, our Event, TCTV hub and announcement bar will now look the same, whether you’re on mobile or desktop web. Channels and trending topics can now be found under News. 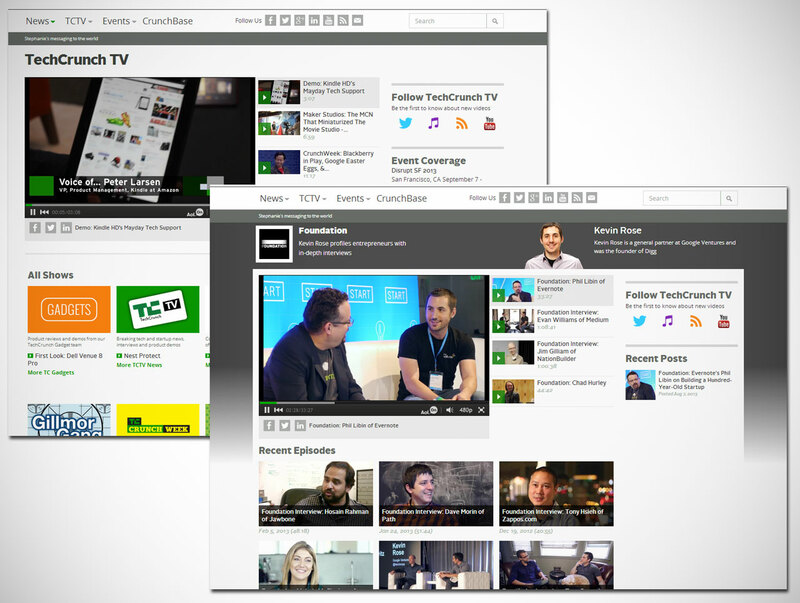 TechCrunch has 11 regular TCTV shows along with countless interview, hands-on, and review videos. Find all of them in the new TCTV hub. As you may have noticed, like with this very post, we have a new, image-focused article template for Feature and Long Form articles. Continuing on the image-heavy bent, we can now support slideshows, which is something we’ve been wanting for a while. Or at least some of us have. The product team included us, Ned Desmond, Christine Ying, Alex Khadiwala, Nicolas Vincent, Matt Burns, Jon Orlin, Bryce Durbin, Sean Nakamura and Stephanie Unger from the TechCrunch side, and Nirmala Lourdusamy, Kaushik Jadav from AOL. Cass Chin (AOL Tech/gdgt) and the APAC team (Chandrasekhara Raju, Binay Jojo, Vishwanath Kulkarni) were responsible for QA from the AOL side. We also would like to give a special shout out to 10up developers, John Bloch, Eric Mann and Luke Gedeon, who were invaluable partners with us on the project. Finally, we want to thank the WordPress.com VIP team, especially Nick Daugherty, Steph Yiu, Mo Jangda, and Paul Maiorana, for their countless hours of code review, planning, testing, and executing the release. As you may know, we’re big fans of redesigning: We’ve done it five times. You can see some of the before pics here and here.